The Parking Lot Attendant by Ethiopian writer Nafkote Tamirat and published by Macmillan Publishers is now available for your reading pleasure. Nafkote Tamirat is an Ethiopian diaspora writer who has an MFA from Columbia University. Her short stories have appeared in Birkensnake, The Anemone Sidecar, and Best Paris Stories. 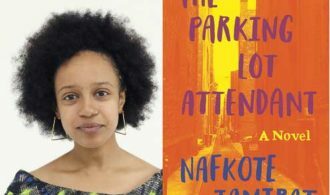 Her debut novel The Parking Lot Attendant is described as a mesmerizing, indelible coming-of-age story about a girl in Boston’s tightly-knit Ethiopian community who falls under the spell of a charismatic hustler out to change the world. You can read an interview about the book here. You can get a copy of the book here.